We cyclists love our bikes. But let’s face it; when we’re not actually riding around on them they can get in the way. Especially if you have a small house or a cramped city apartment. Leaving them outside is not an option as this makes them easy pickings for thieves. And even if you do have a garage at your disposal you might not have enough space for both your car and the bike. Installing a bike storage device in the garage can be the ideal solution to the problem. Don’t worry. This is an easy task and generally only takes a few minutes to complete, with or without DIY experience. All you need is the right device and the correct tools for the job. In this article we’re going to show you three different solutions, all of them easy and quick to install and guaranteed to provide safe storage for your bikes while leaving lots of space for your car and all the other stuff that can end up in the garage. Sounds good? Then let’s take a look at which bike storage device is best for you. Which type of storage device do you need? Choosing the right storage device for your particular situation is the first and most important part of the job. This will depend on the type of bike (or bikes) you own and how much space you have in your garage. Bike storage devices come in many different designs, from simple hooks in the garage ceiling, vertical racks on the wall to more advanced systems of pulleys and hoists that allow you to raise the bike up high and then park your car underneath. 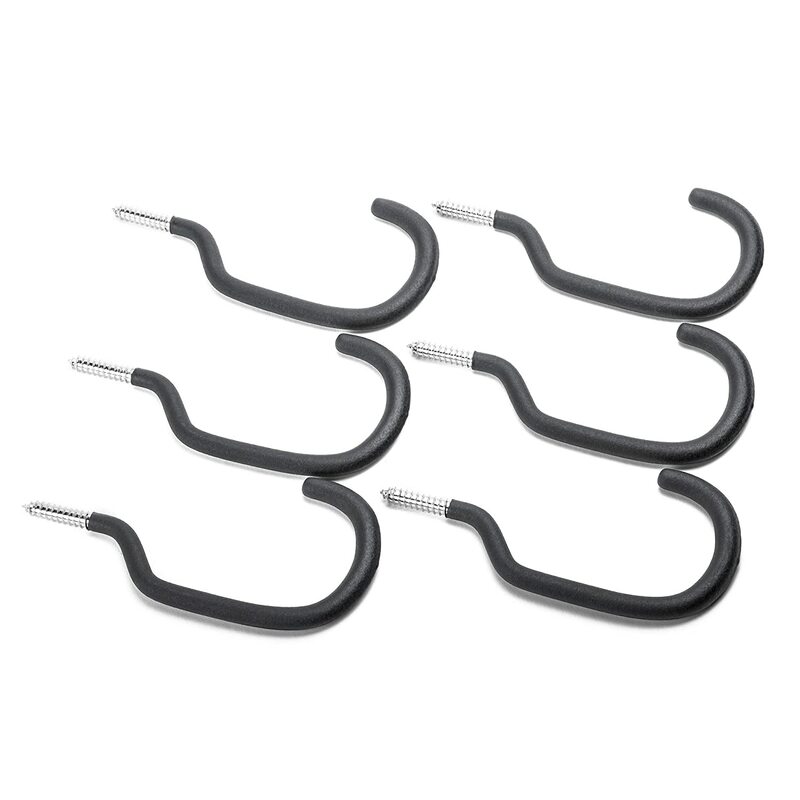 Probably the simplest solution to your bike storage problem, these hooks can be bought at any bike or hardware store and are relatively inexpensive. Simply screw the hooks into the wall or the ceiling, but make sure you fix them into a stud or another stable part of the wall or ceiling so the hooks can take the weight of the bike without being ripped out. Once you have the hook safely fixed, all you have to do is lift your bike, catch the wheel with the hook and let it hang down vertically. There is no risk of damaging the wheel and your bike is then safely out of harm's way. Hooks are an ideal device for cyclists who are looking for a quick and uncomplicated storage solution that allows for ease of access and a no-fuss method of operation. Another simple solution designed to store single bikes from your garage wall. 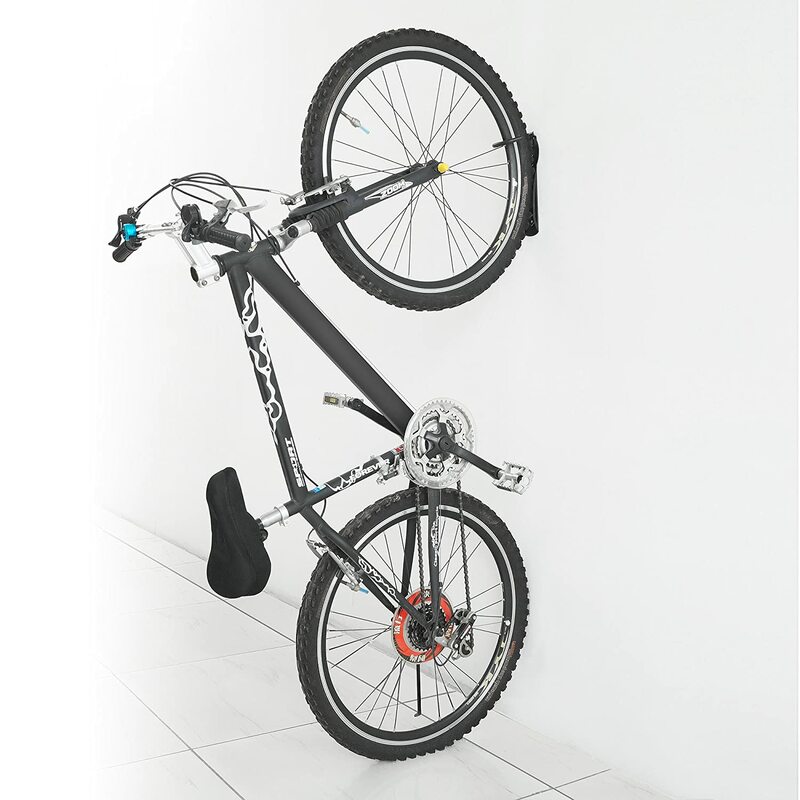 Vertical wall mounts are easy to install and do a great job of keeping your bike up off the floor and out of the way. Wall mounts will usually come with the screws you need to fix it to the wall so all you’ll need to do is drill guide holes into the wall and then follow up with the product screws. Again, remember to drill into wall studs or solid brickwork if possible. It’s also a good idea to check to see if the mount comes with any weight restriction to make sure it is designed to take the weight of your bike. If you’re really picky you might want to use a spirit level to make sure the top and bottom holes are absolutely vertical and the bike doesn’t hang at a slight angle once you’re done. Fixing a wall mount for your bike takes literally minutes and is so easy, almost anyone can do it. Gravity bike stands come in one or two bike versions and again are simple to install and easy to use. 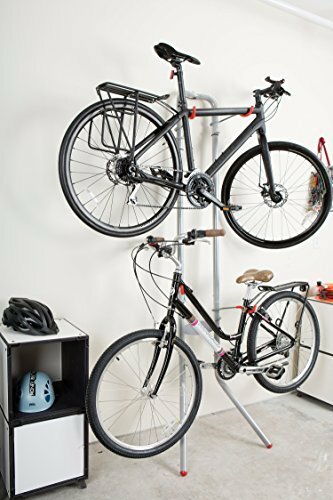 The biggest advantage gravity bike stands have over other storage devices is that when in use the bikes hang flush against the wall, which means they take up even less space. In an ideal situation, you will have enough height to store the bikes one above the other with no overlap. This will make accessing each individual bike a lot easier. If not then you might find yourself in a situation where you have to remove the front bike to get at the one behind and then replace the first bike again. But even then the gravity bike stands offer a good solution to your storage problems and if you shop around you’re sure to find them at a reasonable price. Fixing the gravity bike stand to your wall is just as easy as the other devices but will generally need more screws to compensate for the weight of an additional bike. As with all the devices which need to be fixed in place, make sure you screw into thick wooden studs or solid masonry. Why not try your very own DIY solution? For those of you who possess DIY and hand-working skills, you might want to check out this great video. It shows you how to build your very own bike storage system for under $20 and if you follow the instructions step by step it really does look quite easy. Thanks for reading this article. Of course, there are other solutions out there which we haven’t included here. Many of them will be just as good or even better than the devices we have described, and life being what it is, which one you choose will depend largely on how much you want to spend. Our advice would be to do the research before you buy and make sure you only spend money on a device that will fit your particular needs. We hope we could provide you with some insight into the solution to your bike storage problem and if you have any questions or even some suggestions of your own then drop us a line, we’d love to hear from you. But for now, that’s all folks. Happy cycling and whatever you do, stay safe! How Much Does the Total Gym Cost: Is It Worth It?